ANDERSON — After three season-opening defeats, all to Class 4A top-15 squads, Anderson’s girls basketball team found the competition more to its liking Friday night. The Lady Tribe played like they were facing an inferior opponent, that being very aggressively and smart. Anderson pressured Richmond into 35 turnovers, and seven players combined for 27 steals in a 78-45 runaway at the Tipi, as the Tribe got their North Central Conference schedule going on the right foot. 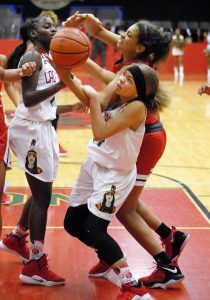 Stashia Hamilton had 23 points, Tyra Ford 16 and Erin Martin a rare double-double of its sort, 13 points and 10 steals, in lifting Anderson to its first win of the season against losses to Pike, Lawrence North and Fishers. The most telling stat for the Tribe was points off turnovers. They converted 20 Red Devil errors into 42 points, with Hamilton scoring 17 and Martin 10 off takeaways. Richmond (0-2, 0-1) was consistent in turning the ball over, with nine in Quarters 1, 2 and 4 and eight in the third. The Tribe sent that message early, as Hamilton scored the game’s first seven points, including a 3-pointer and two free throws after her teammates came up with steals. Aside from a couple of brief Richmond runs in the first half, Anderson made sure the Devils didn’t threaten. The Tribe led 20-9 after one quarter and 31-15 before Richmond scored six to end the half. Anderson put it away with a 12-0 run in the span of just under two minutes midway through the third period, including eight straight off five Richmond turnovers, and it was 50-28. Though the Tribe had it in hand as the fourth quarter began, they kept their foot on the gas and in turn widened the margin. They outscored the Devils 26-9 in the final eight minutes and had 14 points after taking the ball away. “I felt overall our defense was solid, and they did a nice job of eliminating threats, and whenever (Richmond) would make a run or got within 10, we were able to pull away” Cleckley said. Hamilton, a 5-foot-3 senior, also had five assists and three steals, and with 3:15 to go scored her last basket off a behind-the-back pass from Martin after the latter came away with her 10th steal. Martin also had five assists and Ford four to go along with five steals. Reserve LaKevya Wills, the Tribe’s other senior, added eight points and five steals. Anderson made 30 of 64 field-goal tries (46.9 percent) and was 8-of-23 from 3-point land, with Hamilton hitting three and Wills two. In the junior varsity game, Anderson prevailed over Richmond 32-15. Juli Thach and Koral Wheeler both scored six points for the Tribe. Anderson’s next contest is next Saturday at Connersville. This article appears courtesy of The Herald Bulletin, which has covered Anderson High School Sports since 1893. Support local journalism and subscribe today!